A topic I hear a lot of talk about on etsy is that of Branding. With that in mind, I’m always thinking of how to grow my business and my product lines with cohesiveness. I’d love for people to get a glance of one of my photos and know instantly – yup, that’s a Cozy Cottage Creation! So, when I got the urge to create some new designs for my pencil cups, I felt like I had a bit of a dilemma. How do you create a recognizable look without boxing yourself in, just making the same thing over and over? I love my pencil cups, and up until recently, each and every one had only been decorated with polka dots. Would I be moving away from a cohesive look if I started creating new designs for them? Variety is great, but the possibilities are endless. I decided to introduce just a few new looks, and keep it to designs that have already appeared on other products in my shop: a scroll, bumpy balls (on the way), flowers, and one other to be revealed later (stay tuned!). The photo above shows my new pencil cups in different stages of creation. I also realized I could create a consistent look through my photos. One of my treasured possessions is an old wooden stool that my grandfather built for my mother. She used to get carsick on long trips up the windy roads (before highways) to their summer vacation spot in New Hampshire. So, to help her see out the window, he made this stool to sit on in the back seat (before kid’s car seats, too!). Now her stool serves as my favorite photo prop. It has just the right “cozy cottage” feel. 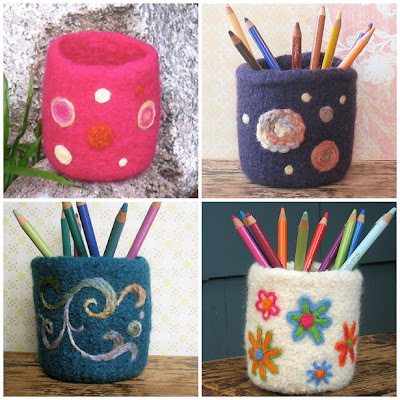 This mosaic shows my new pencil cup photos, and the first photo of my very first pencil cup. Hmmm…now which one of these things is not like the other! your new pencil cups are awesome! i love them, lynne! and i'm so glad you shared them with us!